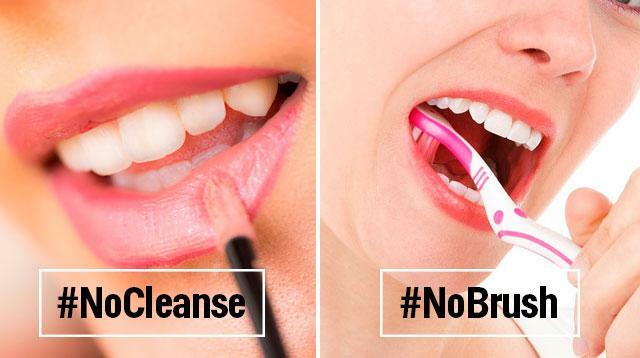 Which Is Worse: Not Brushing Your Teeth Or Not Removing Makeup? If you *had* to skip one, which would it be? It happens. You come home super wasted after a crazy night out, and the only thing you want more is to pass out on your bed. Hygiene? Ehhh, that can wait until tomorrow. Or can it? What exactly happens when you hit the sack without brushing your teeth or properly cleansing your face? And which is the lesser evil if you *absolutely* had to do just one? MarieClaire.com spoke with two experts, and here’s what they found out. According to celebrity aesthetician Renée Rouleau, "If you don't wash your face at night, you are transferring a day's worth of oil from your hair and face, as well as makeup, onto your pillowcase. If you don't change your pillowcase daily (which most people certainly don't), then all of this keeps getting added onto your skin each and every night." But just because you’re that rare breed of person who actually changes her sheets on a daily basis, it’s really not an excuse. You’re still speeding up your skin’s aging, not to mention clogging up your pores with filth and grime. And you know what that could lead to: breakups galore. Nasty breath is just the tip of the iceberg. As Dr. Timothy Chase of SmilesNY explains, plaque and bacteria build-up "can cause bad breath, cavities, and gum disease in a very short amount of time." As if that’s not terrifying enough, he adds, "these oral conditions have also been proven to be associated with systemic problems over the long run, such as coronary artery disease, diabetes, Alzheimer's, and low birth weight infants." After learning about these from the pros themselves, we’ve come to the conclusion that it’s a lose-lose situation. You can’t do one and skip the other—BUT on the (hopefully) rare occasion that you *must* choose, it’s really your call. Ask yourself: Which one would have a more adverse effect on your health in that moment and in the long run?